Below are the official 2016 Hockomock League Volleyball All Stars, selected by the coaches in the league. WELLESLEY, Mass. – As many teams in the Hockomock League and surrounding area know, Canton is atop defensive team year in and year out. 2016 was no different as the Bulldogs relied on its defense to clinch its 10th straight Hockomock League title and second consecutive trip to the D2 Central Final. But as good as Canton’s defense is, top-seeded Hopkinton had a superior offense. The Hillers used a well balanced attack to score a 3-0 win (25-14, 25-17, 25-17) over the Bulldogs and claim the D2 Central sectional title. Hopkinton offense made it tough for Canton. The Hillers consistently had at least two attacking threats at the net and at many times, all three spots had top hitters. Add in the fact that both of Hopkinton’s outside hitters — Amanda Gilbert and Julia Canestrari — showed off the ability to hit cross court and line shots consistently. Hopkinton created separation early on the opening set, using a 5-0 to break a 4-4 tie. Gilbert and Mikayla Pucci each had a kill and Canestrari had a kill and an ace to force a timeout from Canton. The Bulldogs kept it close, down 13-10 but Hopkinton rattled off five straight points, capped by a kill from middle Jill Czerepuszko on a quick set. The Hillers went on to take the set 25-14. Canton stayed even with Hopkinton in the second set, the teams being tied 2-2, 4-4, 5-5, 6-6, and 8-8. But once again, the Hillers created the separation they needed with a quick run. A 10-3 spurt put the top-seed up 18-11, an advantage that Hopkinton held for the rest of the set. Kills from Canton’s Cassie Loftus (four kills) and Casey Shea brought the Bulldogs closer but Hopkinton took the 25-17 win. 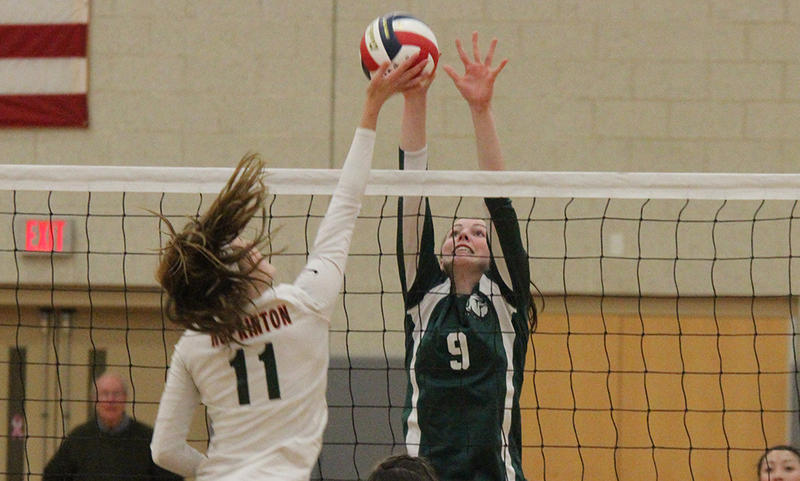 Loftus had a pair of early kills in the third set but Hopkinton’s offense came roaring to life. A 10-1 run turned an early tie into a 12-3 advantage for the Hillers. Canton had a 5-0 run of its own to get within four at 16-12 but Hopkinton answered with a 5-1 run of its own. Murphy (six kills, two blocks) finished off a set from Nicole Poole (14 assists, 13 digs) to bring Canton within five late but Hopkinton won the next three points on kills from Canestrari to win the set 25-17, and the match. Canton volleyball finishes the season 18-4 and as D2 Central Finalists for the second straight year. It marked Canton’s fourth trip the sectional finals in the past five years, despite the Bulldogs returning just two players who saw meaningful minutes a year ago. “I told the kids nobody in the world expected us to be here except for us, we had faith in ourselves,” Cawley said. “It was a whole new team, we only had one and a half positions back from last year. That left five and a half to replace, including the libero. They all played a little bit last year but very few minutes for most of them. Foxboro, 1 vs. Weston, 0 – Final – Foxboro sophomore Nic Beigel scored with a minute to play to give the Warriors the win. With the victory, Foxboro qualifies for the MIAA state tournament via the Sullivan Rule. Sharon, 6 @ Norwood, 0 – Final – Ally Filipkowski and Ally Steinberg each netted a pair of goals to pace Sharon’s offense in a win against Norwood. Alex Rabb and Amanda Klayman each scored a goal apiece as well. Franklin, 3 @ Attleboro, 0 – Final – Franklin picked up the sweep on the road to earn its 12th win of the season. Maddie Kuzio paced the Panthers with 28 digs and four aces while Maggie Doyle added five digs and three blocks and Erin Skidmore had nine kills and eight digs. Foxboro, 0 @ Canton, 3 – Final – Canton celebrated its 12 seniors with a 25-19, 25-13, 25-16 win. “Each senior made contributions to the win,” Canton head coach Pat Cawley said. In the third set, Canton senior Nicole Poole recorded her 1000th assist on a kill by Emma Murphy. “Nicole is a selfless and talented player who has put her mark on CHS volleyball,” Cawley said. Mansfield, 0 @ King Philip, 3 – Final – King Philip clinched the Kelley-Rex division title with a 25-16, 25-22, 25-20 over Mansfield. Sydney Phillips had a strong day with 16 kills and five service points. Carly Adams added 29 assists and 13 service points, Amanda Loewen had eight digs and 10 service points, Liv Balduf finished with six kills and 10 service points, Angela Vellante had 18 service points and two aces and Molly Croke added six digs. For Mansfield, Chloe Peters had 22 assists and eight service points, Meg Hill had 11 kills and Olivia Broyles added five kills. Oliver Ames, 3 @ Taunton, 1 – Final – After dropping the first set, Oliver Ames rattled off three straight to get the win, 23-25, 25-2, 25-21, 20-15. Alyssa Gavin led OA with 17 digs and five aces while Bridget McCarthy added 30 assists and two aces. Kayla Raymond tallied 14 kills and two blocks and Katie Flynn and Maya Fetcho each had eight kills. Franklin, 4 @ Attleboro, 0 – Final – Caroline Lounsbury scored the game-winner four minutes into the game while Cassi Ronan, Erin Walsh and Annie Walsh each scored once. Kate Morse and Annie Walsh each had two assists along with one assist from Dana Lewandowski. Christina Lucini and Anna Jardine combined for the shutout in goal with four saves. Oliver Ames, 3 @ Taunton, 1 – Final – Sydney Hedrick, Sarah Stevens and Cristina Boudreau each scored a goal for the Oliver Ames while Dimitra Efremidis had a pair of assists and Kendall Clifford had one helper. Katie Vamosi made five saves in net for the win. Sharon, 0 @ Stoughton, 5 – Final – Mia Russell paced Stoughton’s offense with two goals while Olivia Schlehuber, Kamryn Oliviera and Thayna Oliviera each netted a goal apiece. Milford, 1 @ Canton, 3 – Final – With the match tied 1-1, Canton erased a 23-18 deficit in the third set and picked up a 26-24 win to go ahead 2-1. The Bulldogs went on to win 3-1, 25-14, 21-25, 26-24, 25-17. “It was a great hard fought match tonight,” Canton head coach Pat Cawley said. Nicole Poole – “always our backbone,” Cawley said – led the Bulldogs with 29 assists, eight kills and an ace. 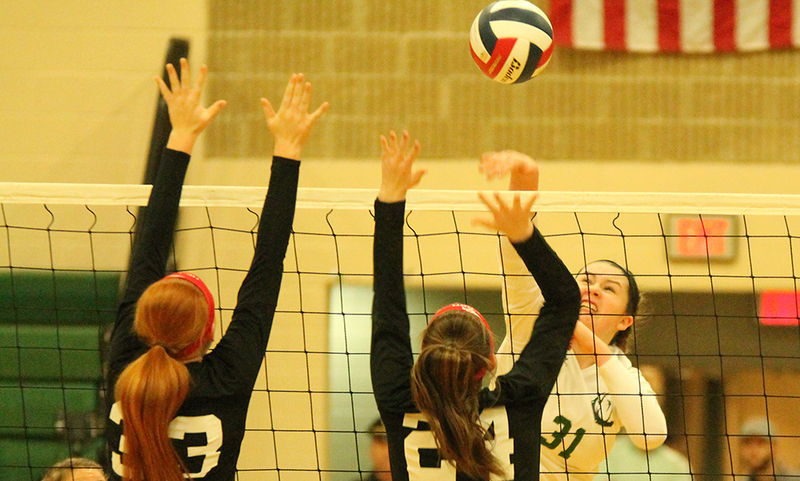 Cawley said Emma Murphy played her best match of the year with 11 kills and a block. Casey Shea added 10 kills and four blocks. With the win, Canton clinched the Davenport division title – the program’s 10th straight title.